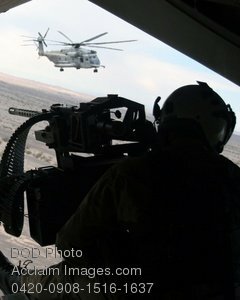 Description: Free, public domain image: Soldier Manning a Machine Gun in a Helicopter . YUMA, Ariz. (Dec. 10, 2007) U.S. Marine Cpl. Corey Fellenzer, a crew chief with Marine Heavy Helicopter Squadron (HMH) 462, surveys the area while manning a 50-caliber machine gun on a CH-53 Super Stallion during a training exercise in support of Desert Talon 1-08 in Yuma. The Marines of HMH-462 are conducting training flights in preparation for deployment to Iraq. U.S. Marine Corps photo by Cpl. Alison L. Martinez.